Tuesday September 6th 1898 We got to Cincinnati about half past eight and after a little breakfast went up town to get tickets fixed. We left Chillicothe about noon and arrived there at nearly four oclock. Mary met us at the depot and we were soon out to her house away from the heat, dust, and noise. A bath and clean clothes followed by a good supper. made us feel very much better. We went to bed early. Wednesday September 7th 1898 Harry went to Cincinnati this morning and Mort was already there. We spent the day here at Marys. Mrs Ellen Dunlap and daughter Blanche spent part of the day with us. Edith is not well. weather some cooler. Thursday September 8th 1898 Mort got home this morning. In the afternoon Mary, Hatt and I went down to call on Offetts, Mrs Esker and Grand-ma McAdow. It was supper time when we got home. Edith still sick. John & Hatt were married 18 years today and Mort & Mary married 30. 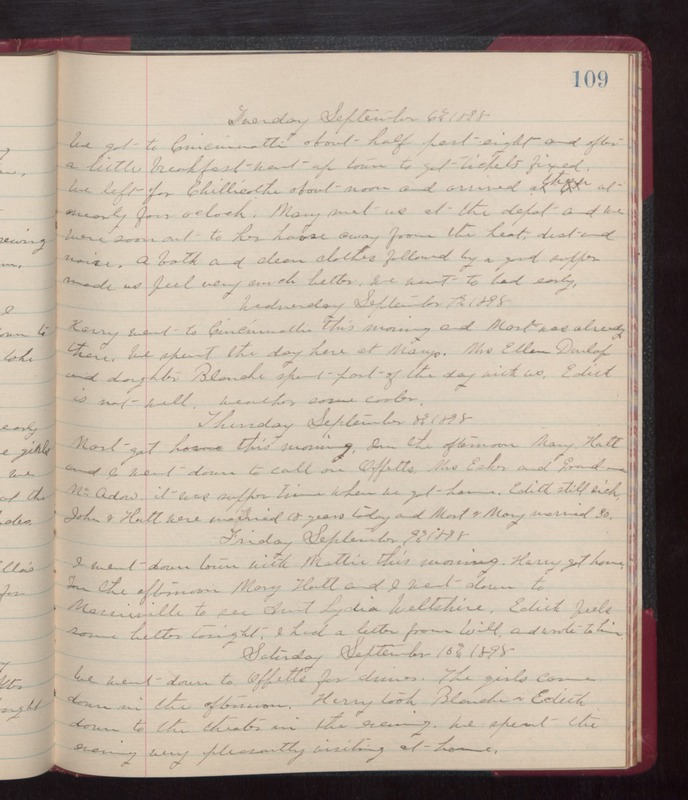 Friday September 9th 1898 I went down town with Mattie this morning. Harry got home in the afternoon. Mary, Hatt and I went down to Morrisville to see Aunt Lydia Weltshire. Edith feels some better tonight. I had a letter from Will and wrote to him. Saturday September 0th 1898 We went down to Offetts for dinner. The girls came down in the afternoon. Harry took Blanche & Edith down to the theater in the evening. We spent the evening very pleasantly visiting at home.